EK-Hosting Review 2019: Is EK-Hosting a Good Hosting? EK-Hosting has been providing hosting services since 2005. Its affordable plans use RAID 6 but have few additional features. EK-Hosting has been providing website hosting since 2005. Its servers are colocated in a fully N + 1 data center based in the Netherlands. This company’s website can be viewed in the default Dutch or can be switched to German or English via a drop-down list that drives the Google Translate plugin. 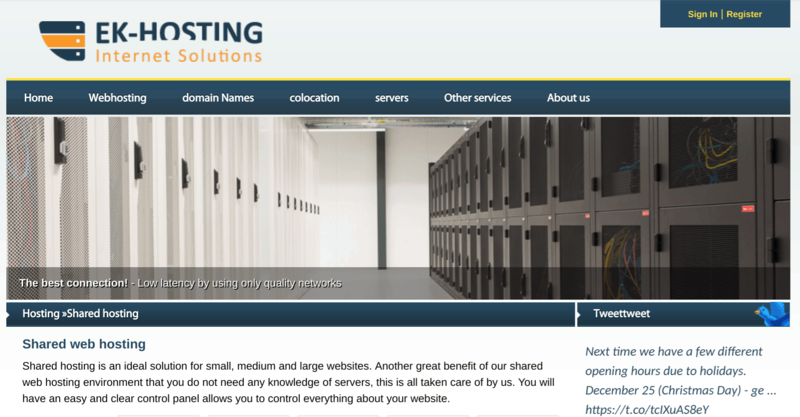 EK-Hosting’s servers are co-located in two Serverius data centers in the Netherlands. Built by ICTroom, these centers are fully N + 1 and are monitored 24/7 by cameras. The IPv6-ready network is powered by robust Cisco and Juniper equipment. With such solid infrastructure, it’s odd that there is no uptime guarantee, although EK-Hosting’s website does link to a third-party testing tool that shows 100% uptime for last 7 days (at the time of writing). 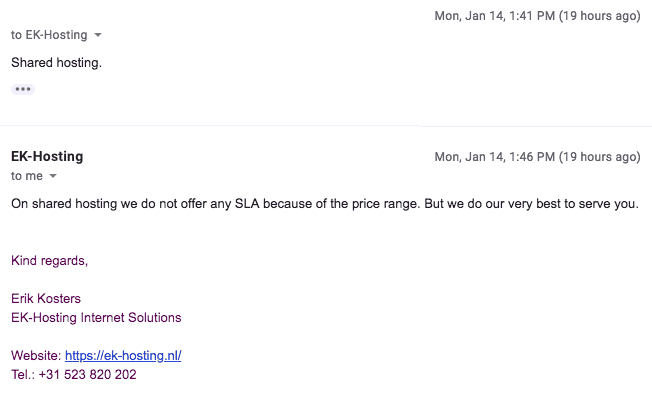 Customer service confirmed to me that there is no service level agreement, but that an SLA could be provided on a case by case basis. There are few additional features; for example, no website builder and no support for advanced coding languages. Beginners get the Installatron one-click installer (for an unspecified number of programs), and experts get support for PHP 5 and the twice-as-fast version 7, plus unlimited MySQL databases. Your data is protected by RAID 6 storage, the Patchman anti-malware tool, and SpamExperts email filtering. Prices are low, which is only fair for the level of features. Whilst the base package does not have enough disk space to be truly useful, the second and third cheapest plans (with 1024 MB and 2048 MB respectively) offer a bit more value for the price you pay. Plans can be purchased in twelve or twenty-four-month terms only. Whilst the prices are low, be sure to consider that domain names, SSL certificates, and VAT are all on top of the base price of hosting. You can contact EK-Hosting by phone or email, and there is an emergency option for calls outside of usual business hours. I emailed them to test their response times. As you can see by the timestamps my emails, I received a response within five minutes, which is a good thing because there is no knowledge base to refer to. EK-Hosting has been providing a full hosting suite including shared hosting since 2005. Whilst you get few additional features and no uptime guarantee, you do get a RAID 6 configuration and support for PHP 7 at an affordable price point. Wondering how EK-Hosting stacks up against other Web Hosting companies? Enter any other Web Hosting company and we will give you a side-by-side comparison.